Short version: I LOVE IT. 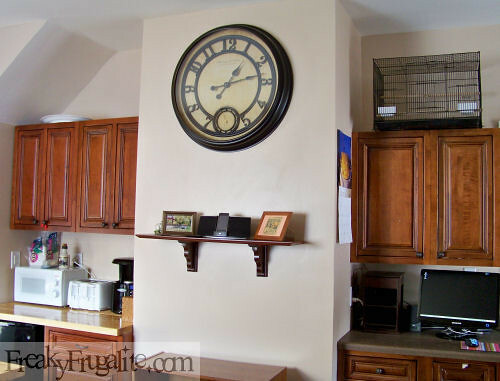 While we worked on our kitchen renovation over the summer, I wanted to create a small space for a “media center.” Even if it was just a small bookshelf, I wanted to make a dedicated area for an iPod/mp3 dock. Our previous little CD player was either on the floor or on a counter, and I never liked the setup. So I created a small mantel shelf under our great big kitchen clock, and we found the perfect iPod/mp3 player for the space: Klipsch iGroove SXT WWI iPod Dock. It looks sweet on the shelf. The Klipsch cost us about $150.00, which is “OK” for an iPod dock. I have seen the lower-end docks around $100, and some higher-end upwards of $300. I think that $150 is a great deal for what you get out the Klipsch. We’ve had it for four months now, and we’re still impressed. 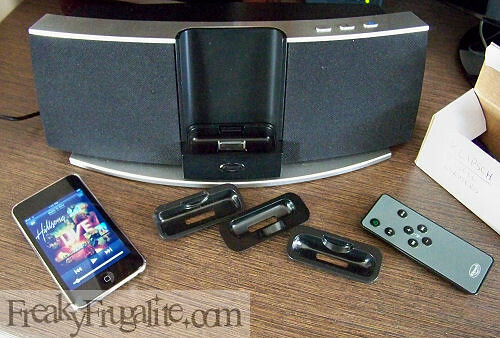 The Klipsch comes with a variety of small plastic adapters to hold various mp3players into the dock correctly. They are not labeled, so it took us a while to figure out what works best for our iPod Touch. The device has a 30-pin connector that accepts many iPod devices. If your device does not accept this connector, you can use the auxiliary input on the back of the device to plug in your mp3 player. One nice aspect of the 30-pin connector is that it charges the iPod while it plays the music. That’s great– you don’t have to leave your computer on to charge the iPod! We just leave the iPod in the dock when we’re not using it. 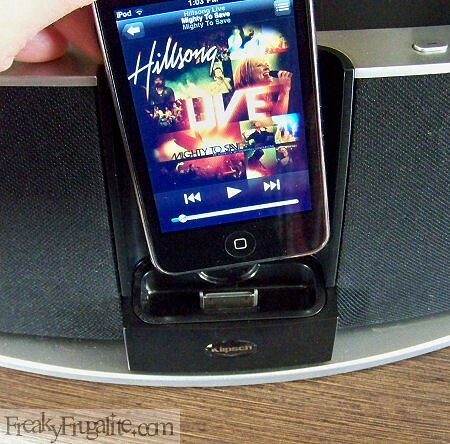 The Klipsch will play iPods, iPhones, and a variety of mp3 players. This makes the kids happy, because they have the Sansa Fuze players and they can listen to their own music when they do the dishes, heh heh. The sound that comes out of this little device is amazing. I often crank it when a good song comes on. The bass is excellent– Klipsch has some bass ports on the sides of the device that removes port noise. At higher decibels, the sound is a tiny distorted. I made a quick video showing you how the Klipsch sounds. Of course, the audio that you hear is only as good as my webcam and the Viddler video compression, but even with all the compression, you can tell that the Klipsch can deliver a meaty, robust sound. As you can see from the video, my iPod was fully operational and on WiFi while docked in the Klipsch. The Klipsch has WWI technology that repels cell phone interference. So while we play music on the dock, we can play games or surf the web with the iPod. 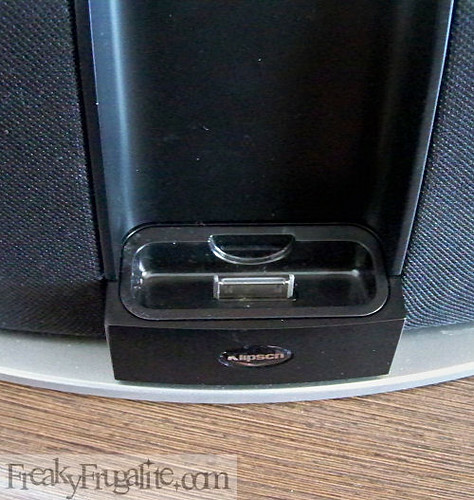 The Klipsch has an S-video post on the back of it– apparently, this is so that you can hook up your TV to the dock and watch movies from your iPod on a larger screen. I don’t have any movies on the iPod, so I haven’t tried out the S-video quality. But it’s nice to know it’s there. One downside to the Klipsch is the clunky power cable, the same kinds that laptops have. It has a thick wire leading to a boxed adapter with a thicker wire for the plug. It’s kind of heavy and ugly, and looks hideous hanging down from my bookshelf. The best thing I can think of to hide this is, what, paint the wall or paste a mural from Amsterdam printing to camouflage it? But I love this device. It’s very classy, small enough to fit on a bookshelf with my promotional mugs and knick-knacks, large enough to belt out the tunes, and it has a convenient remote for when my hands are a tad damp from working in the kitchen. I give the Klipsch iGroove a thumbs up! ← New Family Movie and Exclusive DVD Set Giveaway! Cool! I love speakers, mp3 players, and everything else tech (I’m sure you know that by now!) 😀 I can’t say that I’ve spent over $100 in a mp3 player station, before, but that one looks decent. Thanks for posting.